This novel is amazing! It consists of two very different sections that seem to have nothing in common until a third section brings them together in all their asymmetry. It’s an outstanding first novel. Heck, it would make an outstanding 10th novel. From the very first paragraphs you know you’ve found something special. The main character, Alice, is sitting outside, avoiding reading her book with “long paragraphs and no quotation marks.” While not the same words they form a fun-house mirror image of Lewis Carroll’s opening for his Alice. This 20-something Alice indeed goes down the rabbit hole, starting an affair with a 70-something famous and acclaimed writer — a mirror image of Philip Roth. Part romance, part training for the budding young writer, this section, Folly, glitters with humor, engaging dialogue, and observations on love, life, and the arts. It practically dances forward, brightly skimming the surface of emotions and relationships. The second section, Madness, couldn’t be more different. It centers on a thoughtful, mild-mannered Iraqi-American, Amar. While detained at Heathrow Airport he reviews his life and his inner self. Here the dialogue is serious, situations are dangerous, but hope endures. Reflections on religion, his family’s history, and news reporting are all a part of his emotional inner journey while he goes nowhere at the airport. The two sections seem to have nothing but the faintest of connections — until you arrive at the final part of the book. Then you want to immediately go back and start reading all over again, because your second reading will be even richer and more rewarding than the first. This has been largely covered above: A May-December affair between Alice, a young would-be writer, and a very successful and famous one. This is followed by the travails and deep thoughts of Amar, an Iraqi-American with passports for both countries who has come up against endless bureaucracy at Heathrow Airport and uses that time to review his life through his memories. 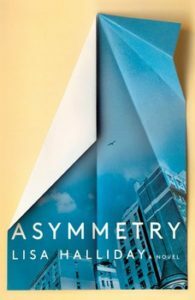 It’s all about asymmetry — in ages, in circumstances, in everything. Halleluia! This Agent Pendergast mystery/thriller gets back to basics: bizarre murders, misleading theories, and Special Agent Pendergast using his formidable mind and unbreakable cool to save the day. I’ve read all the Preston/Child Pendergast novels but was ready to throw in the towel if there was another bogus melodramatic volume. 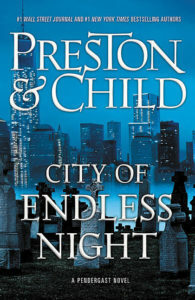 In fact, I was dreadfully anticipating the return of Pendergast’s already-twice-dead evil brother. Whew! This is a legitimate crime spree story. In fact, there are only minimal references to the ongoing Pendergast saga. The only complaint I have is that Pendergast is a minor character for most of the book, ducking in and out of the action until the rousing final chapters. Recurring characters Lieutenant Vincent D’Agosta and reporter Bryce Harriman carry most of the plot. Not to worry, though — again there is no need to have read any previous books. The actual murders are spectacular mysteries. They would seem impossible to carry off, except they happen. It’s all pretty cool. The headless corpse of a young woman is found in an abandoned warehouse. Turns out she’s the playgirl daughter of a tech billionaire. That’s just the beginning of the headless bodies. It’s up to D’Agosta and Pendergast to determine not just who the murderers are, but how many of them there might be, and what possible connection their could be. For more about Preston & Child and their many books, click here. 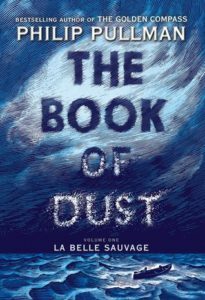 This prequel to Pullman’s highly acclaimed (and controversial) His Dark Materials trilogy does not disappoint. He sets the background for his dust story — a strange material that may prove consciousness is matter — causing stress for the church, which now dominates the state. However, it is the rousing adventure of a young boy determined to rescue an infant girl that forms the heart and soul of the narrative. Be aware, this is the first book in a new trilogy. However, Pullman isn’t going to pull a George Martin or Patrick Rothfuss — making us wait five or more years for the next installment. The second book is already written. In addition he claims that, while the first book is prequel, some of this trilogy’s content will be sequel. If you haven’t read his earlier trilogy, reward yourself by doing so while you await publication. The heroine of his previous trilogy, Lyra, is a mere baby in this volume who only does the usual baby things. Twelve-year-old Malcolm Polstead is the story’s tentpole — an extraordinarily strong, courageous, and resourceful character you immediately fall in love with. While some characters from His Dark Materials return, many others are new. Also returning are the cruel tactics of the controlling Magisterium, the earthly knowledge of the Gyptians, and the relationship between individuals and their daemons (animals that reflect a person’s spirit in some way). It was particularly fun and revealing to read how the infant Lyra and her daemon interacted. Though positioned as a young adult novel, Pullman’s writing is richly satisfying for all ages. And, his imaginative alternative universe is second to none. Malcolm Polstead is immediately enchanted by the baby Lyra, mysteriously placed in the protective care of a nearby priory of nuns. He feels driven to protect her, which makes him an alert observer/spy. The dangers besetting the infant aren’t only human, floods are sweeping the lands. For more about Philip Pullman and his works click here.